The most recent addition to Kahr's line is the CM9. It's intended as entry level or "economy" model, and for this reason it differs from the firm's standard polymer frame pistols in several respects. To hold down manufacturing costs, the exterior of the slide has fewer machining operations—resulting in a rather slab sided appearance—while the plastic front sight is pinned in place rather than using a dovetail cut. There are also fewer markings, and these are engraved rather than rollmarked. The CM9's slide stop is metal-injection molded, not machined, and the three-inch barrel has conventional rifling rather than polygonal used on higher-end Kahr pistols. Last, the CM9 is shipped with a single six-round magazine. 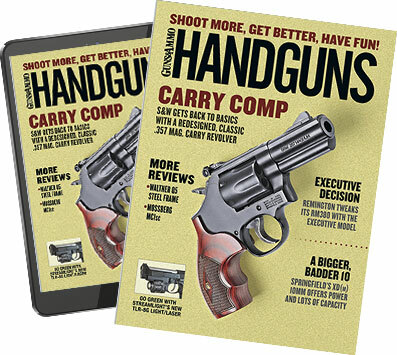 save lot of money that can be spent on holsters, extra magazines and—most important of all—practice ammo. I have to admit was not overly enthusiastic about the CM9 when I got my test sample, but then again, while the CM9 is admittedly less glamorous than its higher priced relations, its plainness does present a simplicity I find desirable. There is nothing here that was not necessary for its intended purpose as a close range, defensive handgun. After chronographing the various loads I set up a pair of combat targets, belted on a Galco Yaqui Belt Slide holster and ran the CM9 through the following a number of drills, including weak-hand shooting, combat reloads, double-taps and slow aimed fire. Being I have a great deal of experience with my Kahr PM9, there was little about its less expensive cousin that I found surprising. The DAO trigger pull was smooth and stage-free, ergonomics were very good, and while recoil was "snappy" the aggressively checkered grip frame helped control significantly. I am a big fan of the white dot/bar sighting arrangement and feel it allows much faster sight alignment than the more common three-dot system. There were a few failures to feed with the Winchester 147-grain load, which I believe was due to it having the greatest OAL of the five types of test ammo. This shows that you should always extensively test a defensive handgun with various loads to find those that function 100 percent of the time. The only complaint we could voice about the CM9 was that the grip was a bit on the short side, which prevented us from taking a full three-finger grip. While this does enhance concealability, it was mildly problematic as regards recoil control. So as to make a comparison we also fired the CM9 with the extended seven round magazine that came with my PM9 and found it provided a marked improvement especially when it came to rapid fire follow up shots. If you have beefier paws you might want to consider purchasing a seven round magazine from Kahr. performs in a most admirable manner. Smallest avg. group: 105-gr. Federal Guard Dog—2.5 in. Largest avg. group: 147 gr. Winchester PDX1—3.25 in. Accuracy results are the averages of five five-shot groups fired from a Caldwell Matrix rest at 15 yards.